Recipe Copyright © 2005 Kasma Loha-unchit. Be sure to read Kasma's Roti article. Sift the flour into a mixing bowl. Sprinkle in the salt and sugar and mix thoroughly. Make a well in the center and add the egg and milk. Fold them into the flour. Add water slowly while working the flour with your hand to form a moist, sticky dough. Knead for 5 to 10 minutes until the dough is soft and elastic. Cover with a damp cloth or plastic wrap and let rest for at least 30 minutes, preferably 1 to 2 hours, or longer. 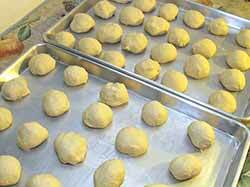 When the dough has rested sufficiently, pull enough of the dough to form a round ball about the size of a large lime. Knead by folding, then punching the dough with your thumb on the palm of your other hand and pushing it through the round opening formed by the other thumb and the index finger or middle finger until it emerges as a round, creaseless ball on the other side. Place on a tray greased with palm or peanut oil. Continue to knead and punch the rest of the dough into similar size balls. There should be enough dough to make about a dozen balls. When all the balls have been formed, grease each thoroughly with palm or peanut oil. Arrange the greased balls on a tray about a half inch apart and cover with plastic wrap. Let rest for at least another 30 minutes, preferably 1 to 2 hours, or longer. Grease a smooth working surface (preferably stainless steel) with palm or peanut oil. 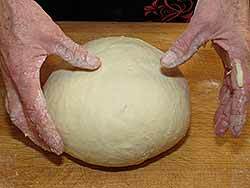 Place a dough ball on the greased working surface and press with the palm of your hand into a flat round. Using your fingers, generously grease both sides of the round. Then pick up the dough round on the edge closest to you, such that your left hand is holding it with the thumb beneath the dough while the other fingers are on top, and your right hand is holding it with the thumb on top and the side of the index finger beneath. Flip the dough in a forward, circular, clockwise motion, slapping the far end onto the working surface and stretching the dough. Continue to flip with the same motion and finger positions several times, stretching the dough with each flip until it becomes almost see-through thin. 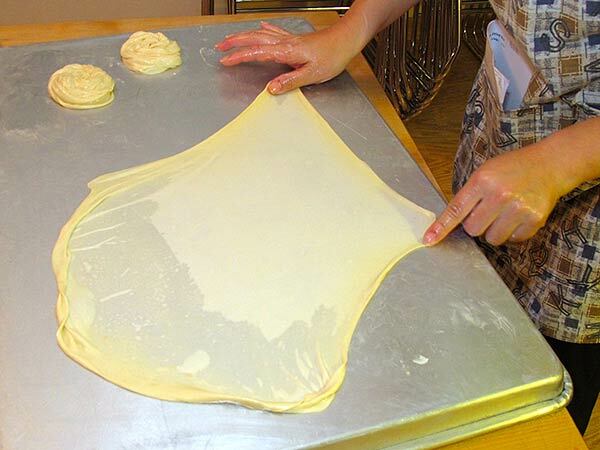 After the dough is stretched as thinly as possible, lift it at one point with two fingers in such a way that it drapes down like a piece of cloth. Using a circular motion, spin the piece loosely into a snail-like round and set aside on a greased surface. Do likewise with all the pieces of dough. Let rest at least 5 minutes. Heat a griddle pan over high heat until it begins to smoke. Add about 1/4 inch of palm or peanut oil to the pan. Reduce heat to medium. Take a dough snail and press it with the palm of your hand into a flat round about 6 inches across. Gently lift it from the working surface and drop it into the griddle. Fry over low to medium heat until the bottom side is browned and crispy. Flip over and fry the second side, adding more oil as needed and pressing the bread down occasionally with a flat spatula so that its bumpy surface gets as evenly seared on the hot griddle’s surface as possible.. If you wish brush a little butter on the top of the bread as the second side is browning for a richer flavor. Remove the crisped bread from the griddle onto a flat surface, lined with paper towels to absorb excess grease. When it’s cool enough to handle, remove the paper towels and fluff the bread by slapping it between your hands – i.e., with the bread lying flat on the surface, position the palms of your hands on opposite sides of it and move them towards each other as if you are clapping. Slap the bread this way 2 to 3 times, until it becomes flaky. Do likewise with the rest of the dough pieces, making sure to add extra oil to the griddle so that the bread gets fried evenly. Also make sure the oil is hot enough to sizzle the dough when you first drop it into the griddle, but not too hot that it browns too quickly. Serve while still warm with a rich curry sauce or massaman curry. The bread may also be served as a sweet snack or dessert. After fluffing, sprinkle with granulated sugar and dribble with sweetened condensed milk. Roll the roti up into a roll and roll it in a piece of paper, which helps absorb some of the grease. Makes 15 to 16 rotis. 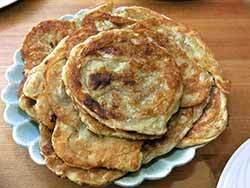 For an egg roti, after the roti is crisped on both sides in the oil, beat an egg and pour over the roti. Turn over and fry until the egg is set. 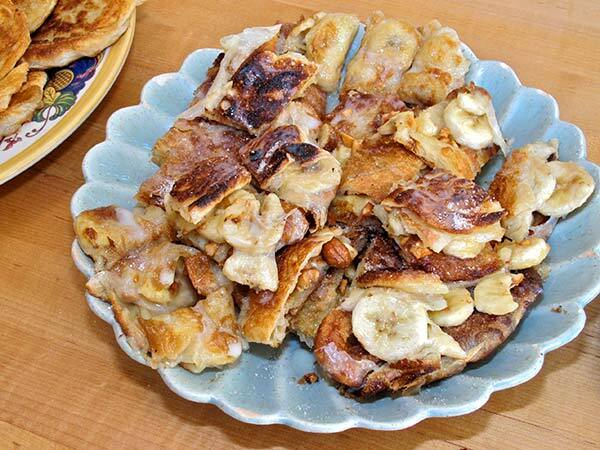 For a banana roti, mash part of a ripe banana (or cut into thin slices) and spoon it onto the bottom half of a very thinly stretched roti round, then wrap as you would an egg roll – i.e. fold the bottom edge up over the bananas, roll over enough to enclose, fold the two shorter sides up, then roll to the end. Because the banana adds moisture, the roti will not fry up as crispy. For a mataba stuffed roti, a curried filling may be made in advance and stuffed into the roti like the mashed banana in the foregoing paragraph as in my "Mataba" Filling recipe. Recipe Copyright © 2005 Kasma Loha-unchit. All rights reserved.